What better way to welcome a new wee one to the family than with some custom baby boy wall decor that you’ve created with love? 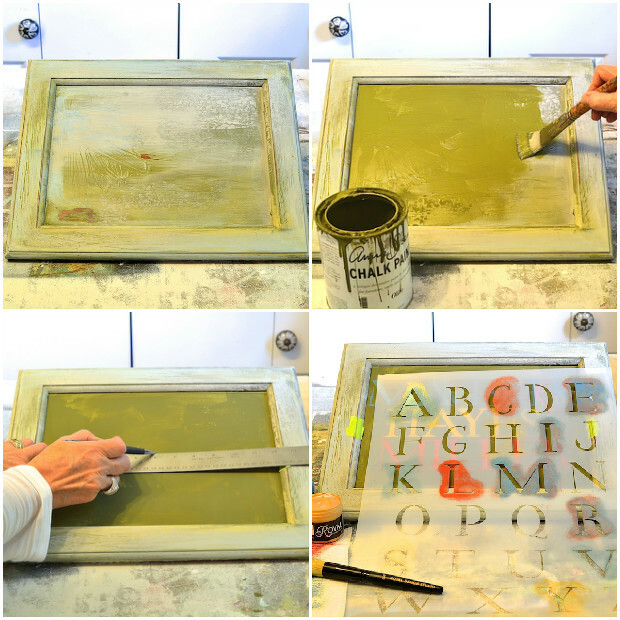 Debbie Hayes shares how to upcycle an old cabinet door into a name plaque with stencils, Chalk Paint® by Annie Sloan and a touch of whimsy…. We are so excited to welcome Maverick, our newest great nephew, brother to 2-year-old red-haired Bowen! We are anxious to see him for the first time, and bring a gift for his room that coordinates with all of his cute new forest and deer-themed bedding. His Mommy sent me color and theme inspiration photos to get some ideas going for the three baby projects I am doing during June for Paint + Pattern. 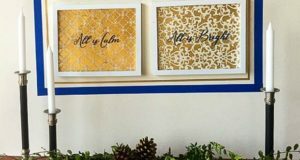 I wanted to make a wall art keepsake piece, and this is the perfect opportunity to use Royal Design Studio’s versatile Classic Letter Stencil. 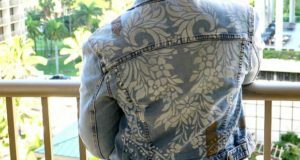 I was headed out the door to the crafts store, car keys in hand, to shop for some type of wood plaque to base my project design on. Something made me decide to root around in the piles of stored stuff from my former faux finishing studio to see what might present itself. Perfect! 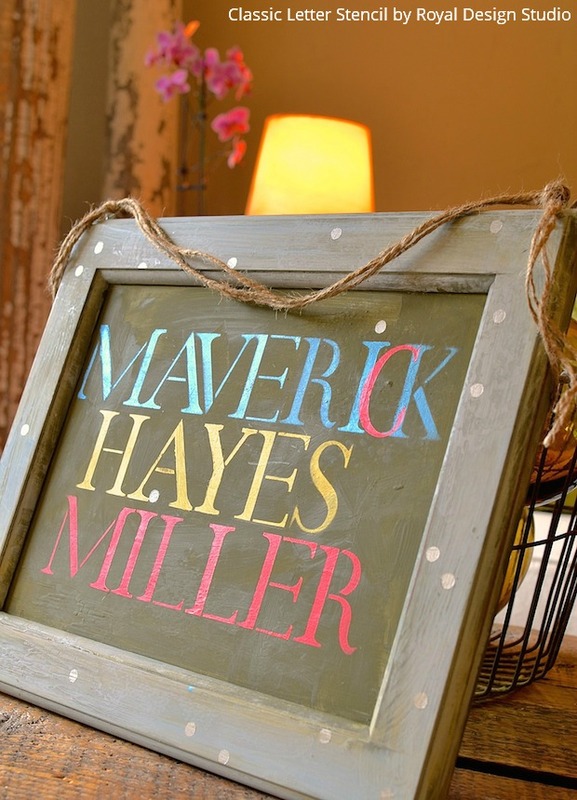 I spied an old cabinet door sample, ready for the trashcan that fit the width of the Maverick’s name, spelled out using the stencil. I love any chance to use something found around the house, don’t you? Let dry. Don’t forget to paint the back. Make light pencil lines for each of the three names. Choose colors as you like, and stencil, beginning with the middle letter on each line, working outward. 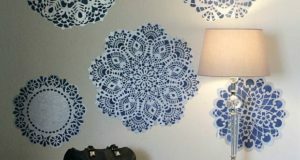 The Royal Stencil Creme paints are heavy bodied so can dry more slowly than other paints. I briefly used a hairdryer after stenciling each letter so I could move quickly. 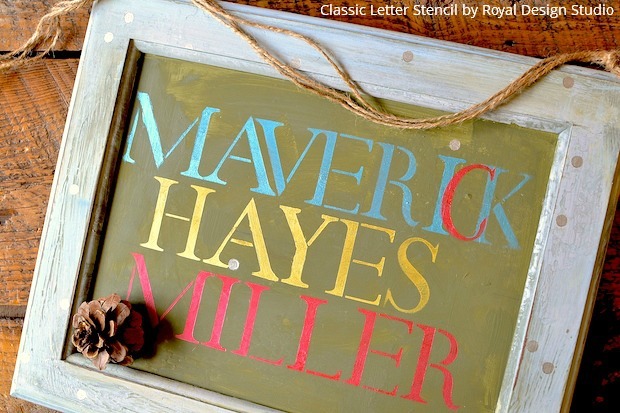 I also did not worry about perfect letter spacing, even having fun with another color in the “c” in Maverick’s name. 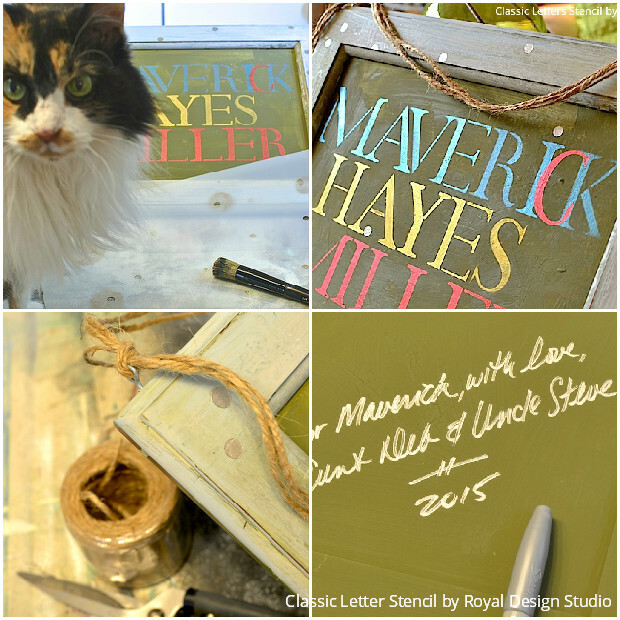 While deep in thought, when your curious kitty silently jumps on the worktable, laugh and offer her a stencil brush. Stencil the edge of the frame, and add polka dots over the “I’s” in the baby’s name. Tap in two eye hooks, then thread a triple length of jute through and tie a knot. Use a silver or white Sharpie pen to add a special thought. Now you’re ready to visit, snuggle the sweet new baby, and present a gift with thought and personal style! 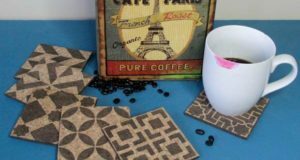 Of course you can take this stencil idea and easily customize it with Chalk Paint® colors and Royal Design Studio stencils that match your own decor. Have fun being creative!! Stay tuned to Paint + Pattern during June for more Baby Maverick projects, including a sweet, stenciled pillow, and a little boy’s splat mat that’s cute and functional too.